Indonesian state steelmaker Krakatau Steel on Wednesday signed a joint venture agreement with Japanese company Nippon Steel & Sumitomo Metal Corporation to build a steel plant that will supply the domestic automotive industry. The joint venture will conduct operations under the name Krakatau Nippon Steel Sumikin, Krakatau Steel said in a statement. There was no mention of the investment’s size. The plant will be located in the Krakatau Industrial Estate in Cilegon, Banten, which is owned by the Indonesian steel maker. Krakatau will hold a 49 percent stake in the joint venture, while Nippon Steel & Sumitomo Metal will own 51 percent. The two companies are seeking to tap growing demand for high-grade automotive flat steel products that are presently supplied largely by Japanese automakers that have grown their business in Indonesia. Nippon Steel & Sumitomo Metal Corporation is the world’s second-biggest steel maker, with a production capacity of up to 50 million tons per year. Amid low borrowing costs and rising per capita income, Indonesians are purchasing vehicles in record numbers. Growing demand helped boost car sales by 26 percent year-on-year in the January to November period of this year, with sales totaling 1,026,758 units. An executive at the Indonesia Automotive Industry Association (Gaikindo), Jongkie D. Sugiarto, said in mid-December that the industry was on track to book a record 1.1 million unit sales by year’s end. Also on Wednesday, Krakatau Steel signed a separate agreement with another Japanese firm, Osaka Steel, to create a joint venture called Krakatau Osaka Steel. That enterprise will produce steel for the infrastructure and construction sectors. Krakatau will own 49 percent of the joint venture and Osaka Steel will control 51 percent. The factory will also be located in Krakatau Industrial Estate Cilegon. 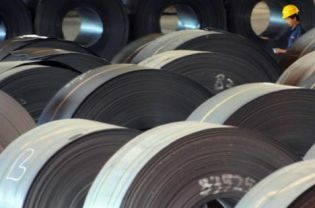 Irvan Kamal Hakim, Krakatau Steel’s president director, said the joint venture would help “improve and strengthen PTKS’s [Krakatau Steel] position in domestic market of long product, especially in terms of rebar and section products. Irvan also cited the benefits the partnership would bring in terms of technology transfer and knowledge sharing. Osaka Steel Corporation is a subsidiary of Nippon Steel & Sumitomo Metal Corporation that makes steel products including billet, rebar and section.